The depreciation of the Sri Lankan Rupee has come into greater focus with the currency trading close to the psychological barrier of Rs. 160 to the US Dollar in recent times. A sum of nearly US$ 220 million in foreign reserves was also deployed by the Central Bank of Sri Lanka (CBSL) in a bid to defend the rupee. Central Bank Governor Dr. Indrajit Coomaraswamy, speaking at a recent public event, noted that there would be no tolerance of further speculation and undue pressure on the currency. “Those who operate in the forex market should know that we have a lot of instruments we can use to restrict banks, importers and exporters … We want to give the market a competitive exchange rate; we do not want to intervene in the market; we want people to behave responsibly and to run the market in a responsible way,” he explained. 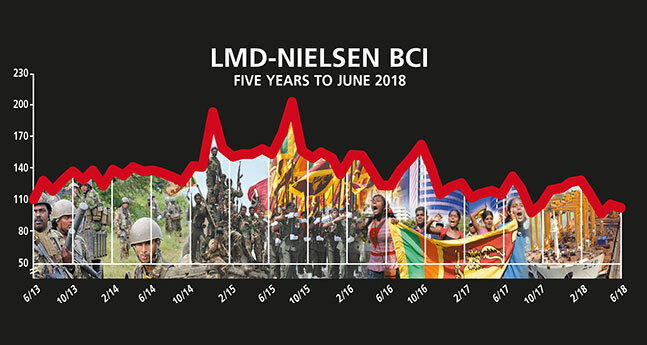 The value of the rupee is among the major concerns highlighted by respondents to the latest LMD-Nielsen Business Confidence Index (BCI) survey as well, so much so that it has led to a slight deterioration in corporate sentiment. THE INDEX There’s been a marginal drop in the BCI with the index declining by four basis points to 102 in June from 106 in the previous month. This is below the 12 month average – which incidentally, was where the barometer stood a year ago – of 115 as well. “Prices of commodities are stable but they’re still high compared to last year and the tax on personal income is now higher,” he adds. SENSITIVITIES High taxes, political interference and the value of the rupee are identified as the primary concerns for business. PROJECTIONS In our assessment of where the index might head last month, we explained that there was little in the way of positive news to propel a major comeback of the barometer of corporate sentiment. This view continues to hold true for the foreseeable future as well especially in the light of the goings on in parliament and beyond it. Multiple sectors of the local economy are under siege as a result of the plummeting rupee, the prospect of spiralling costs and indeed, events on the world stage.